Darien Jack Joyce looks for the deep pass against Brien McMahon on Sept. 15. DARIEN—Four weeks into the season and, to no one’s surprise, the Blue Wave haven’t lost. In fact, they haven’t lost in 29 games dating back to the state championship in 2014. How Darien wasn’t ranked No. 1 at the start of the season is beyond me, but the Blue Wave are back on top and showed in week three—a 42-10 beating of then-No. 3 St. Joseph—no one is really close. We knew the offense had potential—Mitch Pryor came back healthy and has been a star at tailback with 281 yards and five touchdowns despite exiting in the first quarter last Saturday. Behind him, junior Andrew Lucas has been more than useful, averaging almost 12 yards per carry and scoring four times. At the receiver position, the biggest challenge is finding ways to get everyone the ball. Nick Green leads the way with 288 yards and four touchdowns, while Patrick Burke has 241 and two. Max Grant, who has been hampered by an ankle injury, has three scores, while guys like Alex Dehmel, Tyler Herget and Brian Minicus are a threat to make a play at any time. Despite returning just one starter in Mike Neary, the line has been stout. The biggest revelation from the Darien offense so far? Jack Joyce can straight-up play. The senior QB took over after getting virtually no reps last year because of a shoulder injury. Joyce rehabbed his shoulder and is as good a dual-threat QB as you’ll find in the FCIAC, throwing for 942 yards and 10 scores while rushing for 156 more. 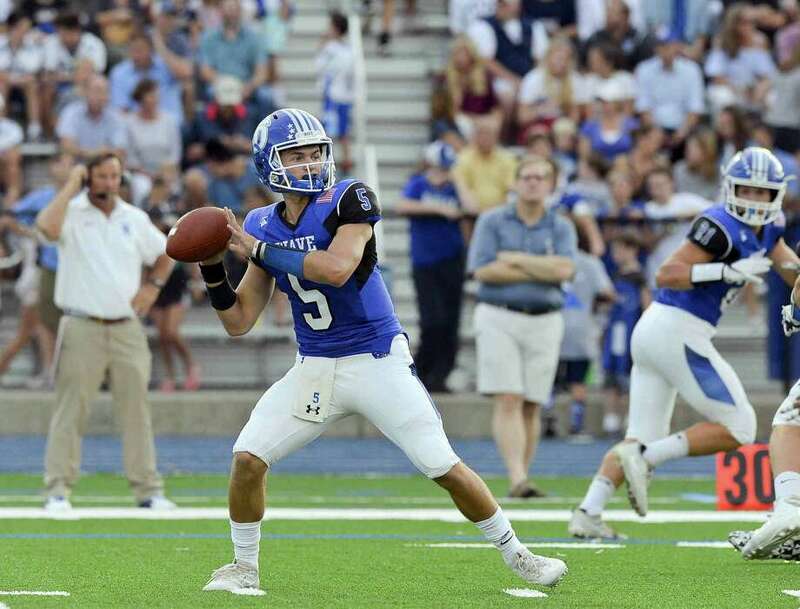 Often under-the-radar, the Darien defense continues to be one of the best in the state (giving up an average of 7.25 points per game) despite what should be huge losses to graduation. The Blue Wave returned very little on the defensive line, but have combined for 16 sacks on the year. The secondary and linebacking corps is among the best that Trifone has had in Darien. Nick Green is a machine at outside linebacker, while guys like Kevin Grune and Connor Fay clog the middle. At the back end, it’s virtually impossible to throw with veterans Connor Tienken and Minicus (four interceptions) patrolling the secondary. We’ll see how good Stapes is when it plays Ridgefield this week. If the Wreckers pass that test, it could be Darien’s first tough matchup of the season following the bye on Oct. 13 at Staples. If Darien gets by them, there’s little slowing the Wave down until their Thanksgiving matchup with New Canaan. The scariest part of Darien? The bye week gives it a chance to get healthy. Sean O’Malley is on track to return in a couple weeks and bolsters both the offense as a short-yardage back and the defense as a pass-rusher. Grant, the leading returning receiver, can gets his ankle healed up and Pryor can nurse his leg injury. A team that has a point differential of 180-29 may be getting even stronger.